For neurobiologist and Chemistry of Life Processes Institute member Yevgenia Kozorovitskiy, every answer has a question. It’s an approach fundamental to her research on neuromodulators, a subset of neuronal communicators that help shape the way we live in many ways as yet unknown. The human brain consists of billions of neurons wired together into intricate circuits by trillions of tiny junctures called synapses — the minute gaps between cells. Crossing each synapse are signaling molecules known as neurotransmitters. These chemical messengers allow one neuron to communicate to another. One neuron produces an electrical action potential and releases fast-acting molecules that make downstream neurons more or less likely to “fire” an action potential themselves. In contrast to this fast method of electrochemical signaling, neuromodulators are a diverse group of molecules — including small molecules, peptides, and even gases — that can function on the broad order of milliseconds to hours. They can also affect large populations of neurons at once. Kozorovitskiy became interested in neuroscience as a career while an undergraduate at Princeton University in the late 1990s. After learning how plastic the brain remains even as it ages — new neurons are born throughout life — she was hooked on the field. 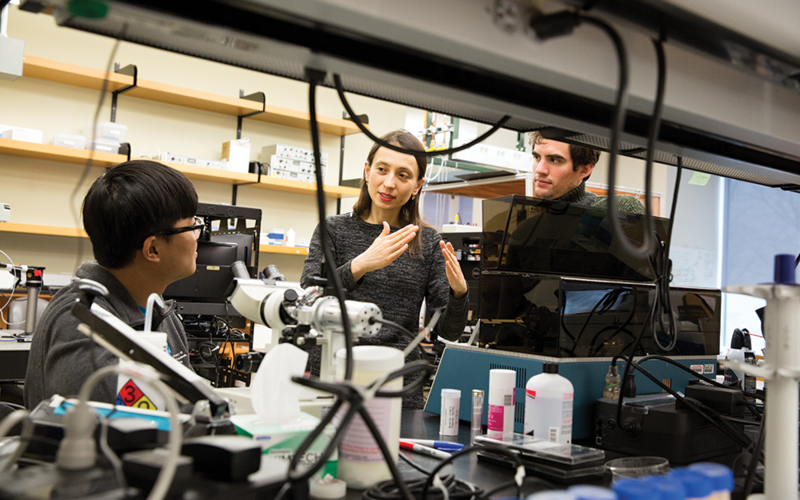 Her studies on dendritic spines, which began when Kozorovitskiy was a postdoctoral fellow at Harvard, continue today in her lab at Northwestern. These spines, which can number 10,000 on a given neuron, are the small protrusions on the branched extensions of many nerve cells. They physically house a large proportion of excitatory synapses, or connections between neurons. Using lasers to activate single molecules of glutamate, a well-known neurotransmitter, Kozorovitskiy has been able to create dendritic spines on demand. The technique relies on powerful chemical compounds that are only activated when exposed to a specific light wavelength produced by a laser. Kozorovitskiy is investigating the amount of glutamate needed to create new spines and how neuromodulators guide this activity, so that scientists may one day co-opt the biological process to heal the brain. Dendritic spine loss is implicated in autism spectrum disorders, Alzheimer’s disease, and depression. To zoom in on individual dendritic spines and cellular organelles even more closely, Kozorovitskiy has collaborated with researchers like Hao Zhang, biomedical engineering, to develop new optical techniques for peering deeper inside the mouse brain and imaging faster at higher resolution. Many of the brain’s basic structures and functions are common across mammalian species. The team’s ongoing use of two-photon microscopy with structured illumination — a technique that relies on lasers to excite fluorescent tags — has produced intriguing results. The Kozorovitskiy lab uses optical tools and other techniques in ongoing investigations of multiple neuromodulators, focusing most on dopamine. This amine influences both movement and cognition, and the lab’s studies could one day lead to new ways of treating Parkinson’s disease. The long-range goal of Kozorovitskiy’s lab is to accelerate understanding of synapse development and neuromodulation, and in turn facilitate the development of therapeutic applications by harnessing the power of neuromodulators to functionally reconfigure, and even rewire, neural circuits. Written by Roger Anderson. Originally posted on the Northwestern News.